The Beyonder purges Illyana of her dark side, leading to a demonic invasion. In the Danger Room, Magneto tests the limits of Sunspot's strength. Despite protestations from Tom and Sharon, he pushes Sunspot to the upper limits of his abilities. Angry, Sunspot storms off, declaring that he learned to handle his strength long ago and that he has no desire to be one of the X-Men. In New York, Kitty studies Norse mythology at the library while she waits to meet Illyana. Aboard a subway bound the city, Illyana encounters the Beyonder. Hoping to bring her joy, he removes the dark aspect of her being and sends her off to spread his message. At the library, Kitty suddenly manifests Illyana's armor and Soulsword, and shortly thereafter, uses them to fight off a group of demons. Back at the school, the New Mutants are enjoying the pool when an eerily serene Illyana appears. She helps Sam attain the same state, and together, they try to force the rest of the New Mutants to join the Beyonder. Illyana explains that the demons now flooding the city are the result of an invasion launched in the wake of her losing her magical abilities, but their threat pales in comparison to the good work being planned by the Beyonder. Unconvinced, the New Mutants battle Illyana and Sam until Dani calls forth an image of Illyana's greatest fear, a massive demon in possession of a captured Kitty, which turns out to be real. As the demon attempts to sacrifice Kitty's soul to permanently open the gateway between Limbo and Earth, Illyana finally breaks free of the Beyonder's influence and reclaims her magical abilities and dark side. She and the New Mutants are able to defeat the demon, rescuing Kitty and saving the day. We're back to Secret Wars II tie-ins, a condition that will continue next issue, after which the ramifications of that story will be felt for the next several issues. This story occurs after Secret Wars II #7 (in which the X-Men and New Mutants made a brief, one panel appearance), during which the Beyonder decided that he would use his powers to help people find their true purpose in life and be happy. Roberto leaves the team as of this issue (he'll be back), unhappy under Magneto's tutelag and, with no interest training to becoming one of the X-Men, decided that he's learned enough control over his power to not need further training. It is the first of two prolonged absences for the character from the team, though he'll still pop up occasionally in the months ahead before his ultimate return. It's established in this issue that Illyana's armor and Soulsword (and, to a certain extent, her stewardship of Limbo) transfer to Kitty in the event that Illyana loses her powers. Future stories will make it clear this is due to the strong bond between the two girls. Power Pack #20, which we'll look at next week, deals with the fallout from the demons which crossed over into New York in the course of this story. 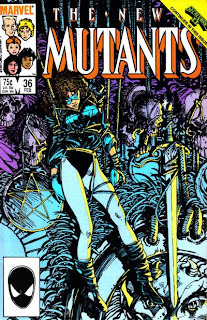 The cover to this issue is drawn by Barry Windsor-Smith, and features Kitty, the second time she has been featured on a cover despite not being a member of the book's regular cast. The New Mutants appear here following appearances in X-Men #201 and Secret Wars II #7. Kitty appears in this issue following Secret Wars II #7, which follows on from Heroes from Hope #1 (which we'll look at next week). Both Magneto and Roberto mention Roberto's encounter with the Beyonder as contributing to his recent behavior, continuing the erroneous asssertion that Roberto was amongst the New Mutants who encountered the being in Secret Wars II #1 (both he and Amara remained behind with the Gladiators). The Beyonder sends Illyana to spread his message aboard a flying subway car, for whatever reason. Sam compares the Beyonder's desire to bring harmony to humanity to an Arthur C. Clarke novel. Doug once again bemoans his lack of a physical power. Most of the team is enjoying the pool when they're attacked by a monstrous demon, meaning more swimsuits (Amara has apparently traded up her more modest one piece for something more Illyana-esque), and Warlock in the shape of a sub. Twice in this issue we're reminded that Illyana's Soulsword is the "ultimate expression" of her magical abilities. Doug once again refers to Dani as "Chief", while Rahne uses "Spaleen" in reference to the Beyonder-entranced Illyana. Young LoveAfter his training session, Roberto angst over his girlfriend Juliana, who died in the course of the New Mutants first appearance in Marvel Graphic Novel #4. There's a house ad for Misfits, a limited series which is, I believe, the series that ultimately becomes Fallen Angels. Secret Wars II once more rears its ugly head, and whereas before Claremont was able to largely sidestep the crossover and prevent it from derailing his ongoing story, here, either by choice or editorial edict, it takes center stage. While Claremont will manage to generate some worthwhile material out of the crossover starting next issue, this issue, unfortunately, fails to rise above the level of "repetitive done-in-one". 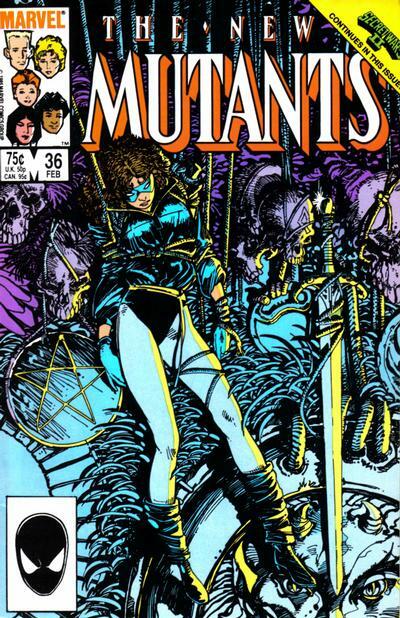 After the opening pages, which take advantage of the new status quo by showcasing Roberto's ongoing antagonism towards Magneto while also continuing the "Roberto is fed up with being a superhero" subplot, the issue settles in for a very "been there, done that" story: Illyana loses control of Limbo, the New Mutants fight demons, the New Mutants question Illyana's loyalties, Illyana proves herself in the end. It's essentially a retread of the series' fourteenth issue, with the Illyana stuff in particular well-trod ground at this point. 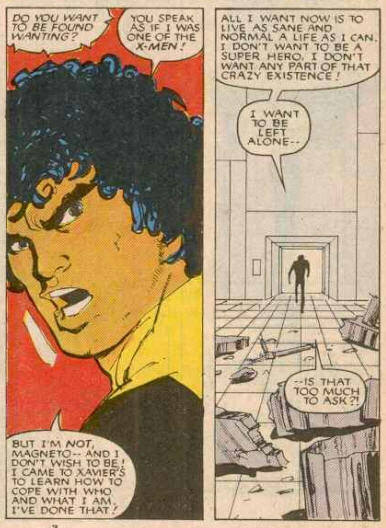 The notion of the Beyonder magicking people into feeling serene at least has the potential for being interesting, but that doesn't really go anywhere here, lending an even greater aura of "who cares?" to the events of this issue. Another Wolverne-centric Alpha Flight story in Alpha Flight #33-#34, followed by continued fallout from this issue in Power Pack #20. Thus begins Barry Windsor-Smith's cover-time with the series. Again, we get another situation of Headmaster Magneto not losing his Badass edge. The Marvel Age magazine at the time also commented on THE MISFITS. I get the feeling that Roberto's angsty plotline & 1st leave of absence was to directly lead to that series, but for some reason got delayed. @angmc43: Thus begins Barry Windsor-Smith's cover-time with the series. I get the feeling that Roberto's angsty plotline & 1st leave of absence was to directly lead to that series, but for some reason got delayed. That's been my assumption as well, though I've never read anything definitive about it. I'll have to check out that Marvel Age article. "Très disgusto," says the kid whose mutant power is languages. I can't decide if that's brilliant or colossally stupid. I was going to ask if Misfits became Fallen Angels. Having seen that you're slightly noncommittal on that point, I did a quick Internet check and Wikipedia says yes (albeit without attribution, so it may be just more supposition). "What's up with Sam's CAT hat? Randomness humor wasn't nearly as pervasive back them, so maybe it stands for something." @Blam - I'm assuming that's an attempt to highlight Sam's rural cred. Where I'm from in NH you'd see CAT (Caterpillar) hats on the farm kids.